Community Launches are intended to showcase the outputs of the project with the larger community in the greater Toronto area, Dartmouth, and Halifax. At each launch, the project website was showcased, digital stories from participants in the respective communities were shared, and a larger community dialogue was sparked about the themes, topics and issues raised in the stories regarding Black-Indigenous peoples. A showcase of the wonderful work of the members in the workshops and community. Their digital stories will be shown to the broader community. Our first launch will be held at the Central YMCA on Grosvenor St., a community cultural hub located in downtown Toronto on July 31, 2018 doors at 6pm. Family, friends and community members are invited to attend! Thank you! 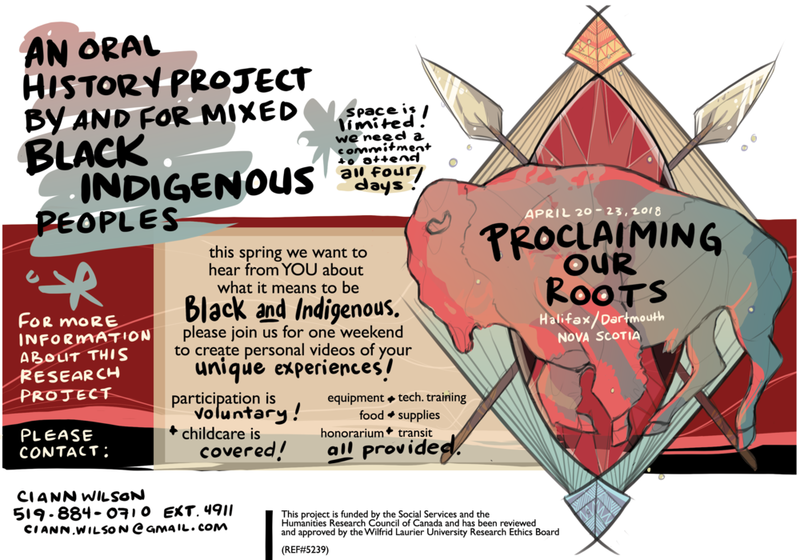 You have been registered for the Toronto Community Launch of Proclaiming Our Roots. The Halifax community launches will be held in Halifax at the Busstop Theatre and Dartmouth at the Black Cultural Centre on April 22nd and 23rd, respectively. See the flyer on our home page, and below for more details.